Welcome to sscale.org the online home of the S Scale SIG. The S Scale SIG is an NMRA affiliated Special Interest Group dedicated to the promotion of 1:64 scale model railroading. As the SIG develops, our hope is the S Scale SIG can provide a unified voice for the promotion of 1:64 scale model railroading within the larger model railroad community and sscale.org can serve as a central nexus of information for modelers, manufacturers and those interested in learning more about S scale trains. S scale model railroading in 1:64 is alive and vibrant with diverse groups of modelers in both standard and narrow gauges. S has always been known as “the perfect size” falling between the larger O and the smaller HO. It is an architectural scale, 3/16″ to the foot, and perfect for operators, model builders and scratch builders alike. If you are an S Scaler, this SIG is here to help you. Consider registering for our forum and joining the conversation or volunteering your time, talent or resources to help promote the scale. All are welcome. The S Scale Journal is the Online Journal of the S Scale SIG. Published periodically, the Journal focuses on 1:64 scale modeling; product introductions and reviews; layout and club features; and overviews of prominent S Scale modelers and their layouts. Would you like to submit an article to The S Scale Journal? 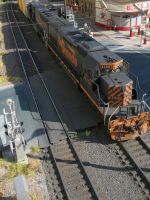 We’re always looking for articles on any aspect of S Scale model railroading. Concerned your writing or photography skills are not good enough? Our editor and webmaster are here to support you in bringing your article to the S Scale community. Contact our editor for more information. By now you know that S is 36 percent larger than HO, is 3/16″ to the foot, and is 1:64 in proportion to the real thing. In round numbers, S is about halfway between HO and O scales. We consider S scale to be the optimum size – with the advantages of both HO and O, but without their disadvantages. Our friends in O scale have beautiful rolling stock filled with visible detail. However, home-based O scale layouts usually have simplistic track geometry consisting of a large circle with short sidings. It’s difficult to construct a full-featured O scale layout in the typical spare room or garage. Authentically-sized large structures overwhelm the available space. Thus, most home-based O scale layouts have only smaller structures, and use building “flats” along the walls to simulate largeness. Figure 1 shows the space requirements in both O and S for a modest 7-stall roundhouse, turntable and lead-in track suitable for a 4-8-4. Note that 81 percent more actual square feet are required for an O scale facility compared to S. How large is your garage? 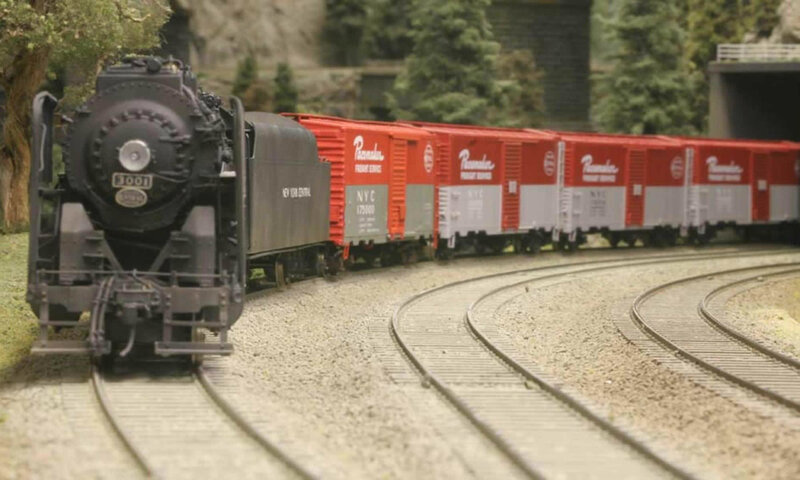 Enjoy browsing this selection of images from S Scale model railroads. Contact the S Scale SIG using one of the methods below.